Friday ended the second week on the job for Brandon Finley and Ethan Valenzuela, who report to CPD for the two final periods of their school day. Both are advanced students in the high school’s Career and Technical Education program’s Law and Public Safety career cluster. Abbott said the application process was conducted just like it would if the students were seeking employment with the police department. On Monday, Finley was up to his ears in paperwork, confirming the destruction of certain evidence and organizing the documentation by case number. The senior hopes to be a future member of those who protect and serve. 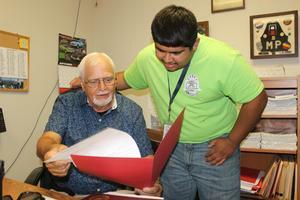 His fellow intern was hard at work with Detective Corporal Dennis Ney in the criminal investigations division. Valenzuela plans to enlist in the U.S. Marines following graduation, followed by college, with the ultimate goal of serving as a K9 officer. Abbott said giving students an enriching learning experience is the goal of police officials in offering the internships. And that includes the non-Hollywood version, rather than the car chases, CSI gadgetry and cases solved in an hour by police portrayers. Crime fighting, too, is on the agenda, as the students do some research involving older cases of property theft. In their first week, they spent time with bailiffs in municipal court, with plans for additional viewings of courtroom hearings throughout the year. The interns will also be given the “feel” of police work, with the issuing of duty belts to wear on the job, complete with handcuffs, radio and flashlight holders and a plastic training gun, sans bullets. They will also wear CPD polo shirts and can wear their Explorer Post uniform shirts. McClure has been receiving reports on his program’s newest intern project—and the two participants. McClure has commended CHS Law Enforcement teacher Michael Thompson for his efforts in preparing students for such an opportunity. 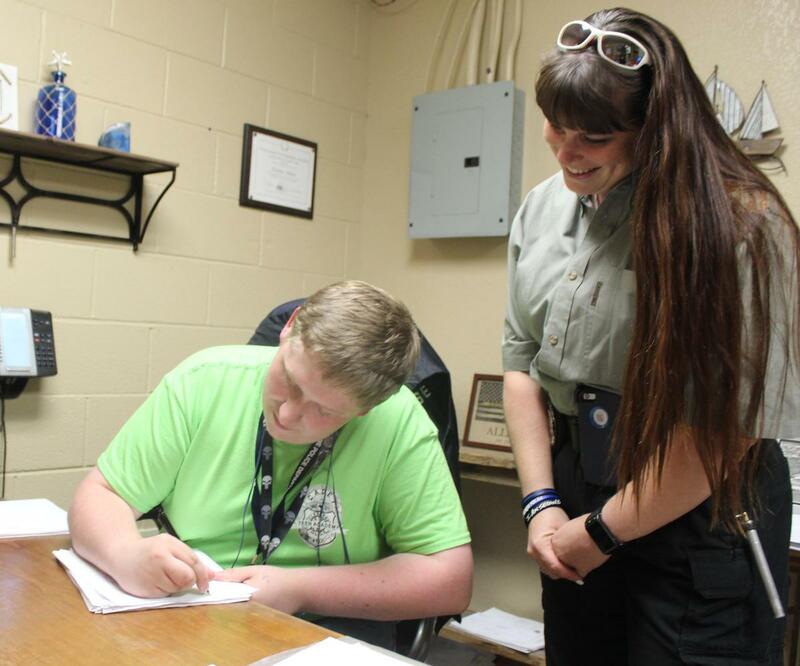 With the internship program now in place, police officials are investigating, with McClure and CISD, the development of industry-level certifications for Cleburne students in the law enforcement cluster. Cleburne Police Community Relations Officer Kerri Abbott looks on as Intern Brandon Finley completes a document while working in the Records unit. Finley is one of two seniors in Cleburne High School’s Law Enforcement cluster participating in year-long internships at the CPD. Cleburne High School senior Ethan Valenzuela looks over a case file with Detective Corporal Dennis Ney while interning this week in the criminal investigations division. Valenzuela hopes to ultimately serve as a K9 officer.